It’s been another day of drama in Westminster – and now a THIRD vote on the May deal looms. THE HOUSE OF Commons has voted to back a short extension to Article 50, to push the UK’s date to exit the EU out by three months. MPs voted to extend the exit date until 30 June. The final vote was 413 in favour and 202 against – a majority of 211 for the government. Several other motions, including one calling for an extension to be sought in order to hold a second referendum, were defeated. Theresa May will now make a third attempt to get the EU withdrawal deal through parliament next week, ahead of an EU summit getting underway next Thursday. If the deal May has been recommending since last November (and which MPs have already rejected twice) does not pass next week then the UK faces the prospect of a much longer extension of the Brexit date or leaving the EU without a deal. A longer extension would require the UK to take part in elections for the European Parliament in May, a prospect the prime minister has said she does not support. The UK will have to ask the EU if it can extend the exit date beyond 29 March and the leaders of the remaining 27 nations will have to sign off on any extension unanimously. Tonight’s motion proposed seeking to extend the period covered by Article 50 until the end of June, noting that if the House passes the withdrawal agreement by next Wednesday then the three month extension will be sought “for the purpose of passing the necessary EU exit legislation”. The motion also noted that if the deal is not passed by next Wednesday “then it his highly likely” EU leaders will decide at their summit that they will require “a clear purpose for any extension, not least to determine its length, and that any extension beyond 30 June 2019 would require the United Kingdom to hold European parliament elections in May 2019″. Seven cabinet ministers voted against the government’s own motion to push out the Brexit date, including Brexit Secretary Stephen Barclay who had earlier spoken in favour of the motion during the afternoon’s debate. Many Brexiteers fear any extension to the exit date will make Brexit more unlikely (with the prospect of Brexit not taking place at all becoming more likely the longer that extension goes on). Even the government’s chief whip Julian Smith abstained from the vote this evening. Former ministers Boris Johnson and Dominic Raab (a former Brexit secretary) also voted against the extension. The original former Brexit secretary David Davis backed May’s motion and voted to delay Brexit. The Conservative MPs who voted against the government motion tonight will not face punishment, as a free vote had been offered by May. Earlier this evening, MPs rejected a motion calling for an extension to Article 50 in order to hold a second referendum on Brexit. Most Labour MPs sat out the vote, with shadow chancellor John McDonnell explaining that today was “not the day to press the public vote issue”. 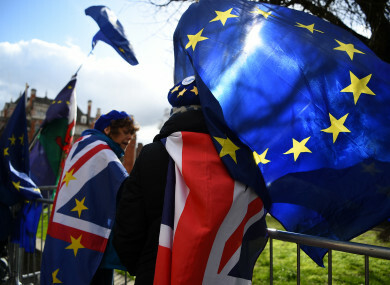 Anti-Brexit campaign Best for Britain said today’s votes needed to focus on “the pressing need for an extension to Article 50″ to confirm the rejection of a cliff-edge exit in two weeks’ time. Labour’s party policy is to try and get its own Brexit plan through first, and failing that it would back a second referendum. The result was 334 against and only 85 in favour. A motion put forward by Labour’s Hilary Benn calling for the House to put aside time next Wednesday for indicative votes on the way forward was defeated by a razor thin majority of two (314 to 312). A separate vote was also held on a similar proposal, putting a deadline of 30 June on any process involving indicative votes. That was rejected by 314 votes to 311. A Labour frontbench motion calling for an extension of Article 50 to allow time to find a different approach was also defeated by 318 votes to 302. EU Council chief Donald Tusk said earlier that a long postponement could be approved “if the UK finds it necessary to rethink its Brexit strategy and build consensus around it”. His comments reflected Brussels’ long-standing position that a closer relationship is possible if May is willing to compromise, notably by abandoning her opposition to joining an EU customs union. Other European leaders have warned that London must define a clear purpose to any extension. Taoiseach Leo Varadkar, speaking in the US, said tonight that he welcomed the vote for the extension “as it reduces the likelihood of a cliff edge, no-deal Brexit on March 29th”. Email “MPs have voted to delay Brexit by three months - here's what that means ”. Feedback on “MPs have voted to delay Brexit by three months - here's what that means ”.